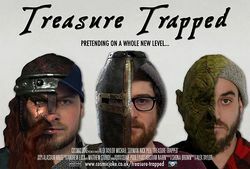 Treasure Trapped is a documentary film about larp. It explores European larp through the eyes of three geeks experiencing it for the first time. Larps featured include Maelstrom, Wasteland, Monitor Celestra, PanoptiCorp, and the Osterkov Efterskole school in Denmark. Production of the film was funded by a Kickstarter launched in December 2012, with filming taking place in 2013. The film was released in December 2014, with screenings for larp communities in Europe and America. The DVD was released in late 2015. ↑ Treasure Trapped, Kickstarter. Retrieved on 2 January 2016. ↑ Treasure Trapped, IMDB. Retrieved 2 January 2016. This page was last modified on 1 January 2016, at 18:20.